Jesse James joins with Missouri settlers in their battle with rich, land-grabbing railroad tycoons. Jesse James joins with Missouri settlers in their battle with rich, land-grabbing railroad tycoons. 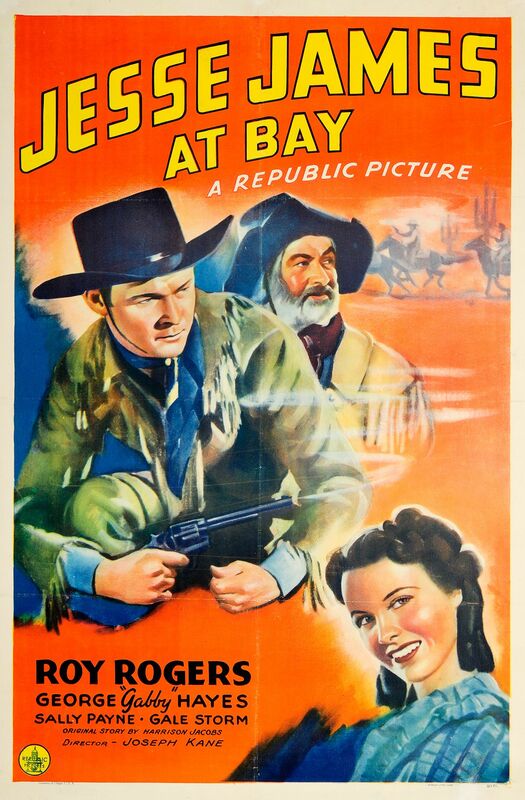 The last of the "Frontier-era" films starring Roy Rogers. From this point forward through the last of the Roy Rogers' film at Republic, the time period was always the "modern west", or the mythical version of such. The exception to all of his remaining films not being set in a historical period was in "Heldorado" that contained a flashback segment. Here, Roy plays a dual role of the title character, Jesse James (Roy Rogers). In order to blacken the name of Jesse James, who is aiding the homesteaders and farmers in their fight against a land-grabbing scheme by the agents of a railroad, Burns is hired to impersonate Jesse. The scheme is successful at first with all but Jesse's old friend, Sheriff "Gabby" Whittaker (Gale Storm), who can distinguish the two men intuitively. Jesse ends that problem by taking out Burns, who had been impersonating him, and then he impersonates Burns in order to get to the root of the problem. The movie starts with the government (I assume) offering land for $3 per acre to people who must improve said land-and then a railroad moves in and takes over the land. The settlers turn to the courts, but the railroad wins the court battle, with the lawyer promising to appeal. Jesse James comes to town-or is he a lookalike gambler, wearing the same clothes? Two female reporters have also come in from St. Louis, hoping to get the scoop on Jesse James, the hero for the underdog (or so this film claims). A railroad official hires the gambler to commit crimes to discredit Jesse James, and the story turns to a mix of confusion. In a shootout, who gets killed, James, or the gambler? Unfortunately the movie fails as history (Jesse James was no hero), or as entertainment-we cannot tell who the good guys or the bad guys are. Even the romance at the end is unconvincing. Despite the all-star cast, the movie is a dud. Roy plays a dual role in this classic western. He plays both Jesse James and the identical bad-guy Clint burns. The case of mistaken identity causes some problems for Jesse as he gets put in jail, then accused of burning down Gabby's house. Gale plays a newspaper reporter who is trying to get the scoop on Jesse. Together she and Roy capture the James Gang. This film may not be historically accurate, but it is great fun and a must-see if you're a Roy Rogers fan or a Gale Storm fan. (Gale steals the picture from Roy).